President Davie Jane Gilmour welcomes Jay Leno to campus. He arrived in a 1937 Packard convertible sedan with a custom Dietrich body, driven by its owner, Claude Williams. Herb Seltzer (right) served as the doorman. Williams and Seltzer are members of the Susquehannock Region of the Antique Automobile Club of America, closely aligned with the college’s restoration major. Leno first toured the restoration and collision repair labs. Here, he inspects the Verrill Wolf Wagon with student guides (from left) Andrew B. Switch, of Lancaster; Joseph M. Kretz, of Plymouth, N.H.; and Sean M. Hunter, of Livingston, N.J.
With the wind in his hair, Leno tools around campus driving the Scripps-Booth Model D with Robert J. Hiller, of Hawley, as his student passenger. Collision repair instructor Roy H. Klinger provides some last-minute instructions before Leno takes a spin in the Wolf Wagon with Switch. Leno chats over the 1970 Chevrolet Chevelle SS with Vanessa Mathurin, of Philadelphia. Leno’s phenomenal familiarity with automobiles impressed students, as he shared a lot of information (and successfully picked his hosts’ brains for more) in a knowledge exchange by the Mustang convertible. A group photo, with the guest of honor in a Bugatti, includes college President Davie Jane Gilmour (right) and Brett A. Reasner, dean of transportation and natural resources technologies (left). It’s the Jay & Jay Show, as Leno dons a Penn College restoration hat presented to him by Jay M. Rhoads, of South Williamsport. … before sliding in behind the wheel. Like thousands of campus visitors before him, the day’s VIP discovers a major selling point of Penn College: spacious, clean and well-equipped instructional space. Leno flashes a peace sign, apropos a vehicle from the 1970s. With a wave to Penn College Police Chief Chris Miller (at left), Leno leaves in the Verrill Wolf Wagon with Switch at his side. … on the open campus highway. Combining “vintage” with “viral,” this photo was a well-liked Facebook sensation. … while backseat driver Hunter captures “the need for speed” on cell-phone video. Hunter shows Leno some of the metallurgy research the students have conducted on the Rolls Royce. … before returning, in action-hero fashion, to the restoration area. Clearly in his element, Leno signals his satisfaction. Student tour leaders Kretz (left) and Hunter review a 1932 Buick with their special guest. Leno parks one vehicle, so as to make room for more. The president gets in on the fun. A modern-day Bonnie and Clyde? No, it’s just Mathurin and Jeffrey P. Darocha, of Ardley, N.Y., hanging out in the Scripps-Booth. The students present Leno with a custom-made Bugatti mailbox in Wildcat blue. From left are Patrick O. Stephens, of White Mills; Mathurin; and Jonathan M. Eldred, of Greenwich, N.Y. The group solidifies the donation with a commemorative photo. During car-exchange activity, Kretz and Mathurin oblige a photographer’s request. The students, Klinger and Reasner strike a final pose with the four vintage vehicles that Leno test drove, their Bugatti and mini-Bugatti mailbox. How fun is that! What a great opportunity! Simply awesome! I know our students had been trying to reach out to Leno and it’s very cool he responded with a visit! This is so cool! What a great opportunity! What a great day for PCT! He doesn’t have time to waste, it must be a first-class facility. Congratulations, all. Fantastic opportunity for the students and the college! Great to have a celebrity like Jay Leno here. Congratulations to all involved! Jay Leno taking time out of his schedule to accept the offer to visit our campus speaks volumes for the programs and especially the skills of our faculty and students. Congratulations on making memories that will last a lifetime. 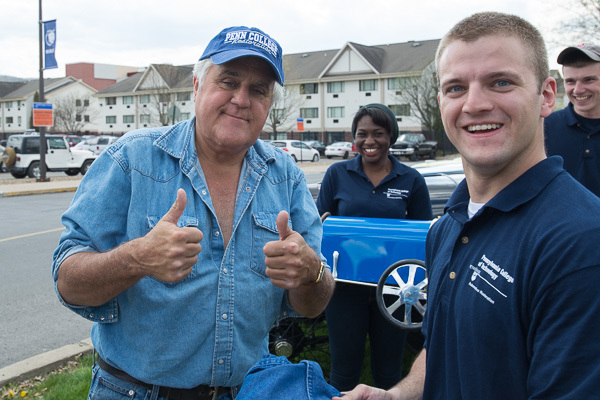 Penn College restoration program is no laughing matter, but Jay Leno seemed to get a kick out of it and a lot of smiles followed. Really nice to let people know what quality technical programs are going on at PCT.